“What do I remember of my early education? Well, not much. and we all sang Marching through Georgia to celebrate. pounding on the desks so the whole place would rock and sway. the floorboards joined in the chorus. The potbelly laughed out loud. hidden off a half dozen woodland lanes. when he invited President Theodore Roosevelt to dinner. and that remote cabin in the woods shrank with each word. on what's most dear to the heart. 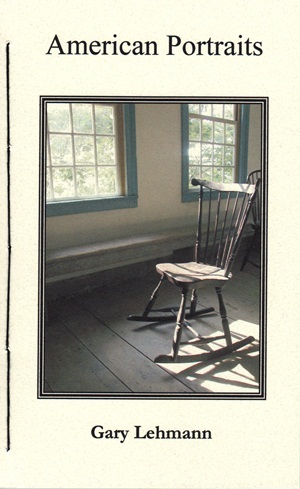 American Portraits is a 76 page hand-stitched paper book with spine - $16.00. In 2006, the United States Congress passed legislation enabling agents of the United States to use what human right organizations describe as torture to obtain information from anyone they deem as harboring information they believe might be helpful to them in the War on Terrorism. In the past, we have always opposed state sponsored terrorism -- when other countries did it. Now we have passed legislation to enable torture on our own behalf, and we don't even know where or when it is being conducted. The government attempted to cover its tracks by redefining the word torture to exclude the practices named in the legislation, but no one has been fooled, least of all those who will suffer physical abuse as a result. We blithely accept that there is a War on Terrorism even though no state of war has been declared in contravention of the War Powers Act. How do we ask other nations to treat their people humanely when we use torture ourselves? The argument for this radical change of policy is that it will protect our rights, but the means used to protect our rights violate what are commonly defined by our Constitution and by International Human Rights Organizations as the basic rights of all people. This state of perplexing contradiction is distressing enough when it occurs in the traffic laws or in tax regulations. It is a call to action when it involves the violation of basic human rights. 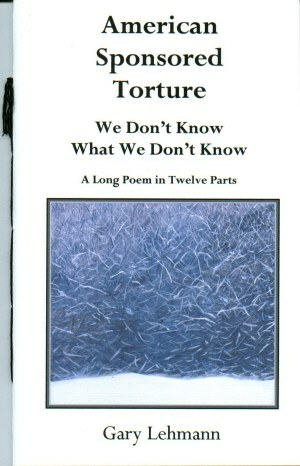 American Sponsored Torture is a twelve part poem exploring these issues. A big gray bird is flying overhead in my sky. but it has no insignia, no windows, and no tail numbers. It is seen near U.S. Air Force bases and flies to foreign places. It contains detainees who have no name. They are not arrested or charged. They are stateless persons without the protection of the law. without my knowledge or consent. They are stateless birds which are evidently invisible. You'll see them all over the country, near Air Force Bases. Henceforth, you are instructed not to see them. We all admire great people, but we often don't understand what it is about them that we admire. Their private lives are hidden in dusty autobiographies which only occasionally reveal an instant which illuminates their greatness in a moment that lasts no longer than the flash of a paparazzo's camera. This book of poems gathers up a parcel of those moments, first in great people's lives and then in the lives of ordinary people, to reveal something of what makes them of interest to us. Each of us has experienced secret moments which have exposed, if only for a heartbeat, our true character. Sometimes we have hurried away from these naked moments, but at other times, we have had the courage to look at them fearlessly, trying to see what magic alchemy they might hold which can turn them into personal gold. 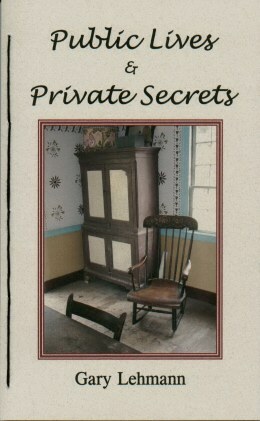 Public Lives & Private Secrets is an invitation to explore the meaning of the secret moments in your life. the best he ever painted. that explained the way people really live. But his old apartment house seemed empty and dreary. deserted him to join the madmen in the trenches. Guillaume Apollinaire, joined up too. The season of emptiness descended. in the cabarets and coffee houses. and brooding on the masques of war. stolen a bolt of linen cloth he had not yet stretched. The insult hit him like a machine gun bullet. from a blank bolt of linen cloth. his cremation on the beach was unbearable. digging the body out of the sand. His skin was chalky gray from the quicklime. The water-soaked corpse took hours to burn. The fire was very hot and slow. Children gathered from the town to watch. Shelley had dared the storm only to taunt him. He refused to be guided by good sense. Had he drowned himself just for spite? skull plate dancing and boiling in the fire. Byron could endure no more. He stripped his clothes and swam into the sea. If only he had refused stupid competitions. Shelley's small boat was too fragile for storms. Lord Byron swam for miles, all alone. he wondered if he had the courage to drown. had found such a heroic end to life? Byron turned back toward shore. More wood was being added to the fire. Everyone was bored with burning dead poets. Lord Byron emerged from a heartless sea. Anais made love all wrapped in irony. the snake within and the tigress without. the trespass between raw nerves and the gift of words. or the sonorous body that made the sound.